LOUISVILLE, Ky. - The Gwinnett Stripers (6-4) plated five runs in the top of the eighth inning and beat the Louisville Bats (5-6) by a 7-4 score Sunday afternoon in the finale of the four-game series at Louisville Slugger Field. 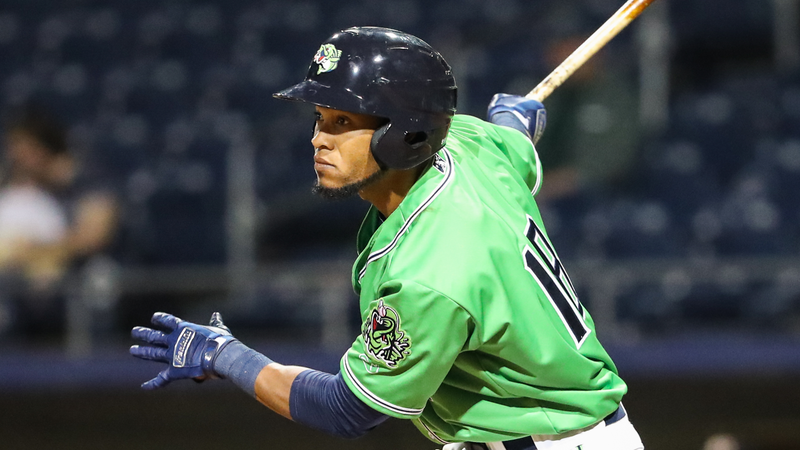 Rafael Ortega homered twice and Pedro Florimon hit a go-ahead two-run single as the Stripers split the series. Scoring Recap: Just as he did on Saturday, Ortega (4) led off the game with a solo home run to right off Louisville starting pitcher Odrisamer Despaigne. Andres Blanco (3) crushed a solo homer of his own off Despaigne for a 2-0 lead in the third. The Bats closed the gap to 2-1 in the fourth as Nick Longhi tripled off Stripers' starter Kolby Allard and scored on a single by Courtney Hawkins. In the bottom of the sixth, Louisville took a 3-2 lead as Longhi (2) hit a two-run homer off Corbin Clouse. In the top of the eighth, Ortega (5) hit his second homer of the game, a solo shot off Ian Krol to tie it at 3-3. Later in the eighth, facing Sal Romano with the bases loaded and two outs, Florimon came up with a clutch two-run single to center for a 5-3 Stripers lead. An RBI single by Luis Marte and a fielding error by right fielder Rob Refsnyder tacked on two runs in the eighth as Gwinnett led 7-3. Connor Johnstone gave up a solo homer to Hawkins (1) in the bottom of the ninth, but Thomas Burrows (S, 2) came on and closed out the 7-4 win. Stripers Stats: Allard went 3.2 innings with three hits, one earned run, two walks, and four strikeouts. Johnstone (W, 1-0) worked 2.0 innings with one earned run on two hits. Burrows retired all three batters he faced over 1.0 inning, striking out one. Ortega was 2-for-5 with two homers and two RBIs, Florimon was 2-for-3 with two RBIs, and Blanco was 1-for-5 with a homer and one RBI. Bats Stats: Despaigne pitched 4.0 innings with five hits and two earned runs. Romano (L, 0-2) allowed four runs (three earned) without recording an out. Longhi had the big game offensively for the Bats, going 2-for-4 with a triple, homer, and two RBIs. Postgame Notes: Both starting pitchers exited the game after a two-hour, one-minute rain delay in the bottom of the fourth inning. Blanco finished the series 8-for-17 with three homers and eight RBIs. Ortega went 7-for-19 with four homers and four RBIs in the series and has homered in each of his last three games. Next Game (Monday, April 15): Charlotte at Gwinnett, 7:05 p.m. Eastern. RHP Mike Foltynewicz (1-1 2.08 ERA) will pitch for the Stripers vs. RHP Donny Roach (0-0, 11.25 ERA) for the Knights. Radio Broadcast: 6:50 p.m. on 97.7 and 93.5 FM "The Other Side of the River."